A few days ago, I posted about a fellow named Bob Larson who claims to be able to exorcise demons from the possessed via Skype. My general feeling was that actual demons, if they're as powerful and evil as the religious claim, would have no particular reason to listen to a guy who was babbling prayers at them via a wonky internet connection from 2,000 miles away. Not that this addresses the deeper problem that there's no evidence that demons exist in the first place. But still. Evidently, there are a lot of people who saw the Larson story and agree with me, on the first point at least. One of them is a gentleman named Isaac Kramer. Kramer, in an interview that you can watch over at Vocativ, said, "They just can't be done that way. If a person is fully possessed, the demon inside of them will not let them sit in front of the computer screen to be exorcised. Chances are, they’re going to throw the computer screen across the room and destroy everything." Which sounds pretty reasonable, until you find out that Kramer is a Catholic priest who is the director of the International Catholic Association of Exorcists, and he's apparently only saying this because he thinks he can do it better than Larson can and resents the competition. I would like to think that belief in demons is on the decline, but if you've been following the news, there have been several recent stories where claims of possession were taken seriously by the powers-that-be. The best publicized, just last week in Gary, Indiana, involved a house that was a "portal of hell," a nine-year-old boy who walked up a wall backwards, and various priests and chaplains and so on -- a story that got so much press that the priest who was in charge of it all, Reverend Michael Maginot, ended up being interviewed on Fox News' show The O'Reilly Factor. Bill O'Reilly, to his credit, started out with the right approach; he asked for Maginot to keep his story fact based, and asked the priest what he knew about the little boy. Maginot responded, not surprisingly, "Actually, I have never met any of the children. The first time I heard about the incident was after the boy walked up the wall backwards... I was in my parish, conducting a bible study, when I got the call, and they called me in to do an exorcism." O'Reilly said, "Now, exorcism in the Catholic church is a serious thing... you have to jump through hoops to get it approved... It disturbs me a little that the boy involved -- and this is according to the newspaper, and other eyewitnesses -- was doing incredible things, like walking up walls, but you yourself never talked to the boy. Why not?" Why not, indeed. Maginot seemed vaguely embarrassed by the question -- as well he should have been. "Well," he responded, " when I went to do the interview, at the home, with the mother and the grandmother, it was a four-hour interview, and the first two hours were basically getting information on all the occurrences leading up to the incident." "The problem I'm having with this," O'Reilly countered, "is number one, you didn't see the boy. The credibility of the Catholic church is in a tough way now, in this country. Exorcism is a serious thing, a very serious thing. I understand you got permission from the bishop in your diocese to do this. But it seems to me that the story is not solid enough to go public with it. There are a lot of people watching right now who are saying, 'this is more mumbo-jumbo from the Roman Catholic church, there's no credibility here at all.' How would you answer that?" More nervous, sidewise glances from Rev. Maginot. "Well, the two boys and the girl, the one boy was put into a lockdown psychological children's ward, and the other two were taken to the Carmelite sisters who take care of foster children. And so they were taken away from the parents, the mother and the grandmother, and so I didn't have access to them. And the mother, I found out at the very end, was also possessed. I put the crucifix on her forehead, and she began to convulse." Righty-o, then, Father Maginot. That's your evidence? And you think that the mother, who was the one who had called in the priests, has any credibility at all? 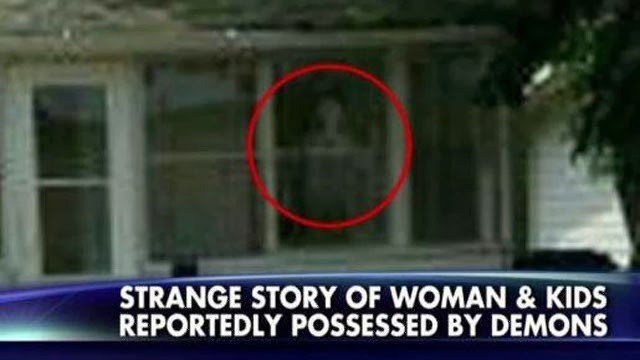 Not mentioning, I notice, that this woman has already been exorcised four times and has a history of mental problems? That the children need to be in foster care not because there are demons roaming around, but because their mother is a raving lunatic? I can't say I often agree with Bill O'Reilly, but this time he nailed it, and asked all the right questions. And it bears mention that O'Reilly himself is a practicing Catholic, who has no vested interest in making Maginot and his In The Name Of Jesus Begone act look silly. To me, this more looks like E.T. the Extraterrestrial than it does like your conventional image of a demon. And all of which goes to show that, as we've seen before, "proof" means something entirely different in the realm of religion than it does in the realm of science. Interesting, too, that it only seems like people who were already religious get possessed, isn't it? You'd think that a strident nonbeliever like myself would be perfect Satan bait. But atheists never seem to need exorcisms. Funny thing, that. Probably the true believers would explain this by saying that we're being controlled by the Evil One, we just don't realize it. You can't win. Anyhow, that's our story for today. I just want to end by stating a hope that the poor kids involved in this mess get some help and counseling, and their mother gets the help she needs, too... probably in the form of some heavy-duty medication. The better part of my life has been spent discussing, watching documentaries on, and generally participating in the hoopla of: extra-terrestrials. At this point in my journey, I'm saturated, and don't really care either way. How is that relevant? If unequivocal proof of Aliens occurred, the notion of our planet being the "center of the spiritual universe" would be blown out of the water. Humanity would be forced to contend with multiple worlds that know nothing of our religions and history, yet deserve the same rights to "salvation" as any other being of high intelligence. It is the death-knell for our archaic, spiritual machinations. Bill O'Reilly toes-the-line now-and-then so we can all say "hey, maybe he's not so bad after-all..." Call me unconvinced. They play a mean game of chess on that network. It's quite diabolical, actually. lol. They invite an athiest onto their network, ask him a bunch of pigeon-hole questions, then when they cut to commercial... "We'll be back with more discussions with 'The Athiest'... stay tuned!" I'm sure this gentlemen, whom you've asked to come onto your program, has a name... but no... he's "The Athiest." according to my understanding, most if not all demons and aliens and by aliens I mean "gray" aliens, and I guess i'll mention reptilians are demonic entities. they were cast out of heaven, they will not receive glory in the celestial kingdom.